Leading Manufacturer of premium austran nuts packaging, almonds packaging, gaia sport trail mix packaging, salted cashews packaging, nut and fudge packaging and nuts packaging from Vadodara. We are offering Premium Austran Nuts Packaging to our clients. Swisspac India offers high quality and excellent appearance Nuts packaging, that is air tight and moisture protected so that the products can withstand the hassle of transportation and remain unbroken and undamaged. We provides higher grade and atmospheric resistant for offering longer shelf life of these sensitive and costly edible products. 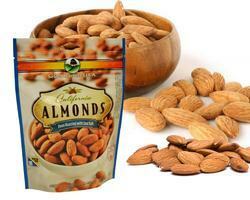 For effective and cost efficient dry fruit packaging. Swisspac India offers best quality and toxin free high barrier pouches such as Stand up & Zipper Pouches and many other Pouches as per customers requirement, which protects from oxygen and another atmospheric effects and keep fresh and hygeine. They are known for their tamper proof, leakage proof, easy opening and closing, tear resistance, moisture resistance, strength and durability. We manufacture Dry fruits and nuts packing material which are suitable to meet the specifications of diverse dry fruit manufacturing industries. Walnuts packaging and many more. We Offer Customised Size as per your requirements and Different Structures. we have facility to In House Designing and digital printing Up to 9 Colours. Printing. 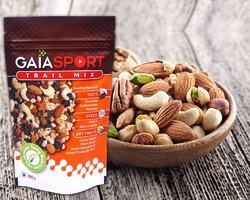 We are offering Gaia Sport Trail Mix Packaging to our clients. 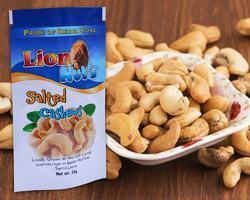 We are offering Salted Cashews Packaging to our clients. 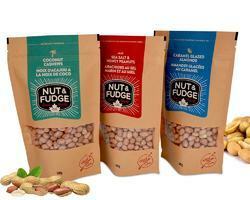 We are offering Nut and Fudge Packaging to our clients. 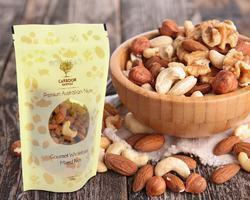 We are offering Nuts Packaging to our clients.